superdumb supervillain: TAG, You're It! Roo is learning to read and constantly surprises me with how much she already knows. She can spell her full name and Mom and Dad (although she prefers to write B-O-B!) and Jasper. At bedtime, she "reads" books from memory, but it seems as though she is actually starting to pick out words. 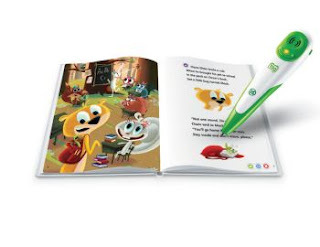 She is at the perfect stage for the Leapfrog Tag Reader, an electronic stylus that "reads" stories aloud. I was really impressed with how quickly she took to it and learned how to use it. 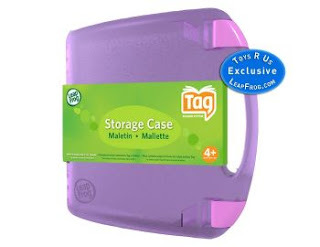 The Tag Reader can "read" by the word, page or full story. It's kind of an updated version of the filmstrips I remember as a kid: "when you hear the bell, turn the page…" only you control the speed and can go back and forth as you please. Being a typical four year old, Roo enjoys repeating the same words and pages over and over and over again… at least repetition builds recognition, right?! An unusual proprietary feature of the Tag Reader is the LeapFrog Learning Path, a free online tool that lets you see your child's learning progress. It's kind of a virtual assessment, based on your child's use of the Tag Reader. You can monitor your child's style of reading and discover new ways to encourage their growth and learning. And as they grow, their LeapFrog Learning Path will suggest different titles and products to transition into. Smart. Like your kids! The I SPY book is on my list fo' sho'! That's pretty advantageous that one can monitor the childs STYLE of reading. I like how the LeapFrog also suggest titles appropriate for your child. Great review! Looks perfect for Roo.